By linking versions and milestones for issues, added Versions/Milestones will help to grasp the upcoming versions and release plans. Versions can be used to specify the version that the issue is related to. Setting milestones for issues, you can set the release plan. Milestones dictate which update will include the solution for each issue. For example, after the recent update of the program, it had 3 more issues to be solved. The team decided that among the 3 issues, solutions for SAMPLE-5 and SAMPLE-6 will be included in version 1.0 and solution for SAMPLE-7 will be postponed till version 1.1. The milestones will be as shown on the right. At first, the team can concentrate on the issues with milestones are 1.0. The “Add versions/milestones” link on List of Versions/Milestones leads to the “Add versions/milestones page”. New version/milestone will be added by entering Add versions/milestones and pressing "Submit". The Edit Versions/Milestone page can be found by following Edit versions/milestones on Project Home. On the edit page, you can change the following settings. The date to start a Milestone. 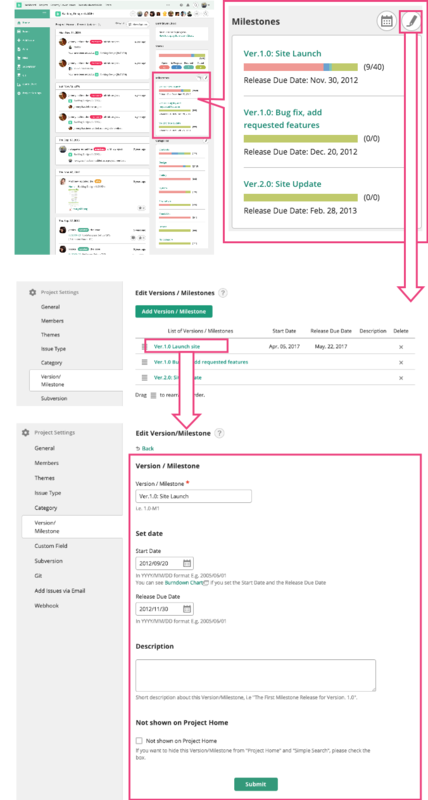 When the Start Date and Release Due Date are set, the Burndown chart will be displayed on the Project Home page. This is only available when the Project setting is set as "Use Charts". The planned date to release a milestone. Explanations about Version/Milestone. This information will be displayed in the Release Note. If you check this box, the Version/Milestone will not be displayed on the Project Home. Please use this feature when the Milestone has been completed or is not valid. Click the button to delete Version/Milestones. Drag & Drop the icon to change the order. Version/Milestones with "Not shown on Project Home" checked in Edit versions/milestones page are shown in gray.